Currently we have a healthy membership comprising of men and women from a wide range of backgrounds, from teens through to retired, and also includes disabled members. Amongst our membership we have serious competition shooters, keen air gun collectors as well as people who simply want to spend a pleasant and relaxing Sunday afternoon enjoying informal target shooting in the countryside. Our site includes, Practice range, Pistol range and HFT course, Tea and coffee making facilities and on site parking. Westfield ARC is affiliated to the National Smallbore Rifle Association, British Field Target Association, Scottish Air Rifle & Pistol Association and the United Kingdom Association for Hunter Field Target. The club treats safety very seriously and carries liability insurance. Westfield holds regular Hunter Field Target competitions. 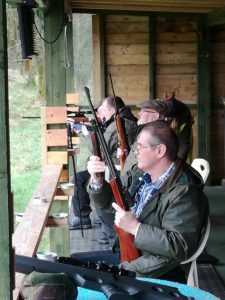 These range from informal members-only fun shoots, through to national competitions including the 2009 SARPA Scottish Hunter Field Target Championships and a round of the 2010 British Field Target Association Grand Prix. Westfield’s charity shoots in 2010 and 2011 raised a total of £870 for the Childrens Hospice Association Scotland. Whether you are an experienced competition shooter, are looking for a safe place to use your air rifle or pistol, or you have never fired a gun before and you want to give shooting a try, Westfield Air Rifle Club is the place for you. All we ask is that you have a genuine interest in shooting and behave responsibly. If you don’t have your own gun, that’s not a problem, we have a number of club rifles available for members and visitors to use. We are located at Muirhouse Farm, adjacent to Strathblane Country House Hotel on the A81, just outside Strathblane.